STEM Center 2019-20 Research Fellowship Program! The SIUE STEM Center is currently accepting applications for its FY20 faculty research fellowship program. 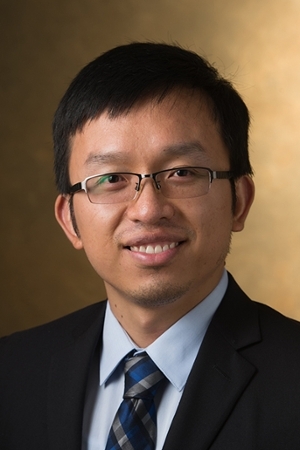 Mingshao Zhang, assistant professor in the Department of Mechanical Engineering, was a STEM Research Fellow for FY19. He worked with the STEM Center to continue development of a remote educational robotic system. This telepresence robot would allow teachers to interact with their students from a remote location, in an easy-to-use and low cost manner. 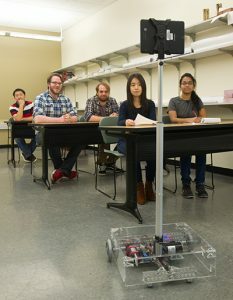 Zhang is investigating the possible effects that a telepresence robot has on student learning and perceptions of instructor credibility, particularly in STEM-related classrooms. In time, Zhang’s telepresence robots could be an asset to learning worldwide, as educators would be able to remotely teach in rural areas of other countries. A distinctive aspect of Zhang’s robots is that they are also equipped with features of social robots to improve the credibility of the instructor and usability in the classroom. Social robots have the ability to follow social behaviors and rules. In this combination, students should be able to engage with the telepresence robot easier, enhancing student learning through remote teaching. Interested in learning more about Zhang’s project? Check out this recent press release on his work. The SIUE Stem Center’s faculty research fellow program is a competitive fellowship, open to tenure-track or tenured faculty members. The purpose of this fellowship is to engage in undergraduate education research aligned with the mission of the STEM Center to innovate ways to engage students in STEM. If you are a tenure track or tenure faculty at SIUE and interest in the faculty research fellow program, click here to learn about the application process. The deadline for the 2019-2020 Research Fellowship is March 25, 2019. For further information, please contact the STEM Center at stemcenter@siue.edu or by calling (618)650-3065.